50 SMT007 MAGAZINE I FEBRUARY 2018 Feature Interview by Stephen Las Marias I-CONNECT007 Aculon Inc. commercializes unique surface coatings leveraging nanotechnology and other surface modification techniques. The compa- ny's original focus was the optical indus- try, developing treatments of prescription eyewear, sunglasses and other optics. In 2010, the company launched its electronics busi- ness, and since then has been one of the lead- ing providers of nanocoating for stencils. Since 2012, Aculon has been a supplier of nanocoat- ing to protect printed circuits from waterproof- ing. In 2015, the company launched its our own series of Aculon branded products called NanoProof. 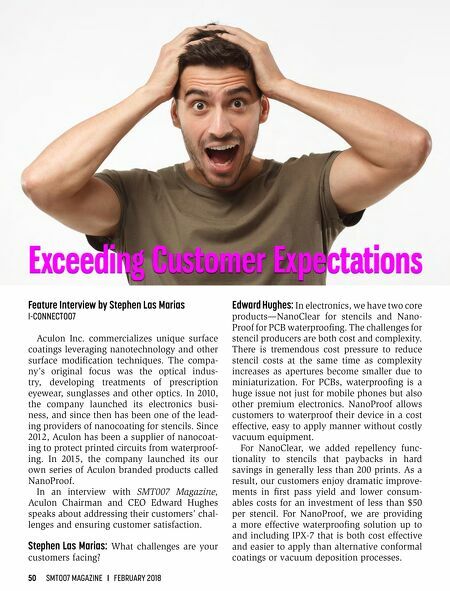 In an interview with SMT007 Magazine, Aculon Chairman and CEO Edward Hughes speaks about addressing their customers' chal- lenges and ensuring customer satisfaction. Stephen Las Marias: What challenges are your customers facing? Edward Hughes: In electronics, we have two core products—NanoClear for stencils and Nano- Proof for PCB waterproofing. The challenges for stencil producers are both cost and complexity. There is tremendous cost pressure to reduce stencil costs at the same time as complexity increases as apertures become smaller due to miniaturization. 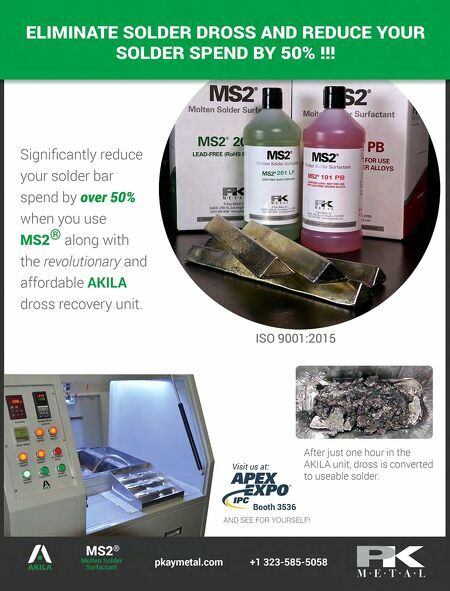 For PCBs, waterproofing is a huge issue not just for mobile phones but also other premium electronics. NanoProof allows customers to waterproof their device in a cost effective, easy to apply manner without costly vacuum equipment. For NanoClear, we added repellency func- tionality to stencils that paybacks in hard savings in generally less than 200 prints. As a result, our customers enjoy dramatic improve- ments in first pass yield and lower consum- ables costs for an investment of less than $50 per stencil. For NanoProof, we are providing a more effective waterproofing solution up to and including IPX-7 that is both cost effective and easier to apply than alternative conformal coatings or vacuum deposition processes.